I believe we have lost a significant part of our history when the two-bay service stations across our country started closing. Like a town losing its school, the local "gas station" defined much of the town's character. Progress hasn't always been progressive, for sure. 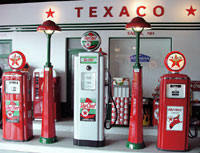 I remember the twirling ball on the old pumps and the ding-ding of each gallon as gasoline was being put in. The old crank bulk oil tanks of earlier days along with their one gallon and two gallon metal oil cans with a spout was the cheapest way of getting your oil. Even earlier were the glass oil bottles. Remember the grease pit...that dark and dirty hole in the floor that one had to go down into to change the oil of a car or pick up truck? It was impossible to come up out of there without being equally dirty. I remember the sights and smells as if they were yesterday. 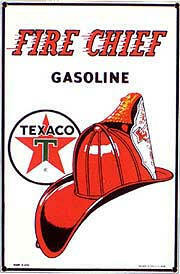 Visions of my own Texaco Station fill my head whenever I smell "Go-Jo". I remember the late nights fixing tires that had the pesky leaks that were hard to find. I remember the girls coming in to visit, and the young Illinois State trooper (like Jerry Corcoran in Gus Wilson's Model Garage) that would stop in with his personal car, a black 1966 Pontiac Bonneville with tri-power and a continental kit. I can remember the scare I had when I was washing the new model Buicks from the local dealership that would bring them to our station for clean-up. The hose spray loosened the chrome on the grill and it flaked off. Thank goodness for warranties. I remember the chilled Cokes that came up out of the old Coca Cola chest coolers that had slots in them that suspended the bottles. I cannot forget the real tutorial I received in service when I would check the oil, water and air and then finish off the job by cleaning the windshields. I even still wear a plaid Mackinaw just like old Gus did in the Model Garage series. I return often to the old station in my mind. It will always be the high-water mark of my life's work experiences. What a shame that the young people of today won't have the experience of working down at the old corner service station.